Hannah Mills creates two easy and festive recipes that are sure to be the stars of your holiday party. The holiday season has officially begun! It’s the time of year for ice skating, Christmas movies and Secret Santa parties! 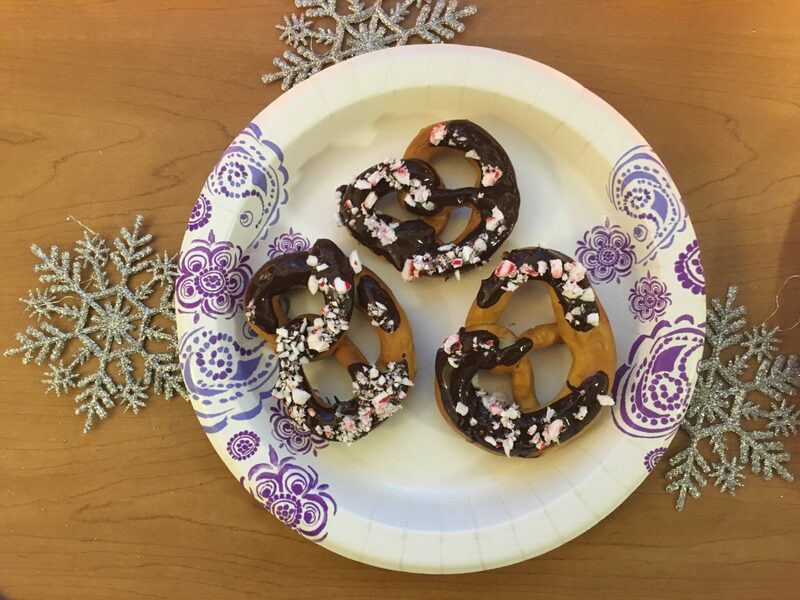 With the stress of finals upon us at last, there’s no better way to relax and take a break from studying than making delicious holiday treats. I’ve created a few recipes that are not only cheap and easy to make, but perfect for any occasion, whether it’s a party with friends or a long study marathon! First, put peppermint sticks in a plastic bag and crush. Crush into small chunks or a fine power, whichever size you like best. Then, pour the crushed peppermint into a bowl and set aside. In a microwave-safe bowl, melt chocolate in microwave OR put solid chocolate over low heat and stir until melted. Once the chocolate is melted, grab your pretzels. Dip the pretzels into the chocolate first, then into the crushed peppermint and set aside for the chocolate to harden. Enjoy! The best method to crush peppermint is using a small hammer, but if not, a metal spoon will also work. Be careful to stir chocolate or it can scald the bottom of the bowl or pan. Pretzel sticks are the easiest to dip into the chocolate. Put all ingredients into crockpot and cook on low 2-5 hours. If no crockpot is available, combine all ingredients into microwave-safe bowl and cook approximately 10 minutes or until red-hot candies have fully dissolved. Serve with a ladle and enjoy! If you want a spicier kick, add more red-hot candies. Try topping with whipped cream to get a richer flavor.